‘Greystanes’ is a Victorian Regency style house and was built for Charles (c.1841-1891) and his wife Mary Hale Lawson (nee Town). Lawson was the grandson of William Lawson, who of the Blue Mountains explorers and receipiant of land grant in 1808 for 500 acres which included Prospect Hill. Lawson’s father Nelson built a large home called ‘Greystanes House’ on this land. 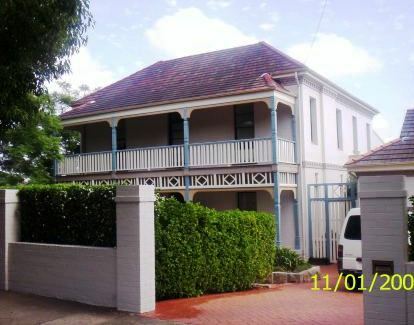 The name of this Strathfield house is an obvious reference to the other Lawson family property. It is likely the house was built by Mrs Lawson’s brother, Andrew Town (1940-1917), a building contractor, who also resided in Strathfield. Charles Lawson died in 1891, either before or soon after the house was constructed. Mary Hale Lawson (d.1931) continued to live at ‘Greystanes’ until c.1913, when the house was sold to Andrew Watt KC (1872-1950), a prominent Sydney barrister. Watt was born in 1872 and educated at St. Joseph’s College, Hunter’s Hill and Sydney University. Watt was admitted as a barrister in 1894. In October 1950, the house was sold by Andrew Watt to John Joseph Shanahan, railways clerk and Gregory Shanahan, public servant for £3300. In December 1951, the house was sold to Guiseppe Russo, a confectioner and his wife Venera. In November 1953, the house was sold to Salvatore and Carmela Spano. From 1954, the Spano’s lived on site but operated a boaring house by leasing rooms to Italian migrants. In July 1969, Carmeta Spano sold the house to Felix Zammit for $42,000, who in October of the same year, sold the house for $44,500 to Aid Retarded Persons NSW, an organisation that operated a boarding house for trainees attending sheltered workshops in the Metropolitan Area. At this time, the house was known as ‘Mawarra Hostel’. The Council boarding house licence issued in 1985 stated the hostel had 14 separate bedrooms, housing 24 people. In 1988, Aid Retarded Persons was liquidated and its administrators Residential Care Inc, placed the property on the market. The house again reverted to private ownership. An application for dual occupancy was approved in 1992, which is actually a rear self contained flat but held within the same land title. Strathfield Council notices of land transfer. (c) Cathy Jones 2010. You must not reproduce this article without obtaining permission from the author.